The Rewa football side received a major boost early this week ahead of the Pacific Cup tournament which started in New Zealand yesterday. 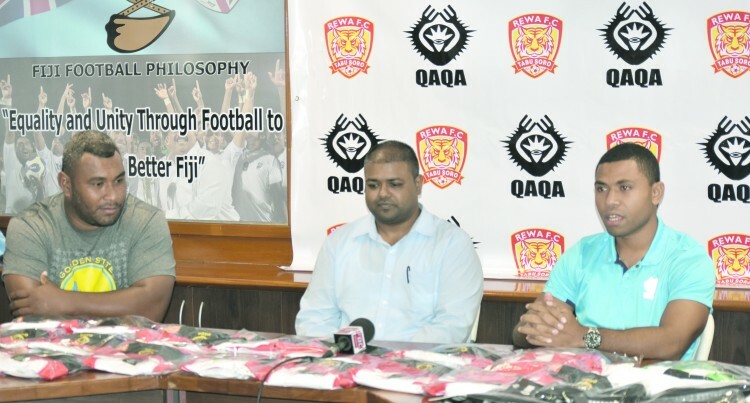 Jacks of Fiji’s Qaqa brand has stepped in to be the official brand sponsor for the team. The company provided $5000 worth of merchandise which included match gears for the five day tourna­ment. Rewa President, Nazeel Buksh was overwhelmed with the support. “Well they have come in at the right time. Just before the start of the tournament and this will be a boost for the players. It is something that we have been trying for some time now and am glad that we have been given the support,” Buksh said. Rewa is pooled with Labasa, USA All Stars, NZFFI All Stars and NZFFI North Shore All Stars in the tournament. Meanwhile, all players playing for Fiji teams at the Pacific Cup tourna­ment will wear arm bands in memo­ry of the late Rajendra Kant Sharma who passed away earlier this week.